I’ve been asked to write about my transition from Hawai’i to Netanya and am glad to share the experience. Marcia, my “best friend from home” lives on the Big Island of Hawai’i. After my husband died, she kept suggesting that I move there so I did – I had visited her through the years so knew the area. I had already sold my house and had moved from Cape Cod, to Tucson, then to Killeen in Texas, where my older son and family lived. So now I sold all the furniture, shipped the car and some boxes and moved to “Gan Eden” – Hawai’i. It is said that the Big Island either grabs you or pushes you away – it grabbed me. It’s also said that living on the Big Island is like living in the 1950’s – and that’s not a bad thing at all. It is a slower way of life – why hurry? where you gonna go? it’s just an island, if you keep driving forward, you will end up where you began. I joined a group that makes lau hala bracelets – “lau” means ‘leaf’ and “hala” is a kind of palm tree. So every week we would gather and weave from the leaves of the hala tree. I also joined a kupuna group – kupuna means ‘elder’. 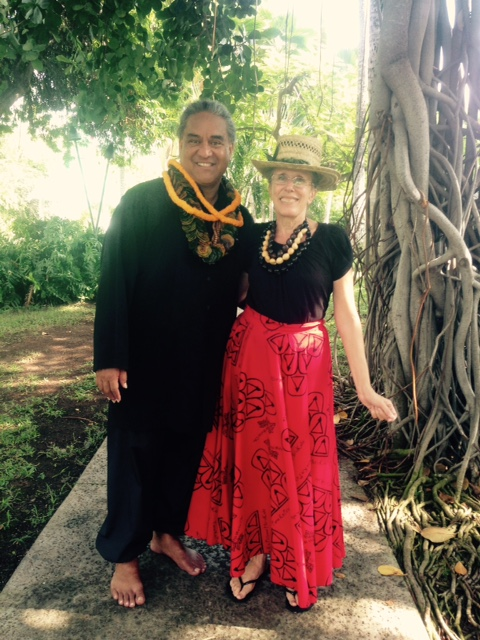 Our kumu – teacher – taught us all things Hawaiian – we sang in Hawaiian, we prayed in Hawaiian, we danced hula, we had a potluck lunch every week with lots of Hawaiian foods – about half the members of the group are Hawaiian, and half not. Kumu’s mission is to bring back everything Hawaiian (that the missionaries had destroyed in Hawaiian culture) so he taught us so that we could model correct behavior for the keiki – children. When the Hawaiian immersion school had a special program, we’d go as the elders and to support the keiki. We also performed all over the island, very often at the Sheraton Hotel. Kumu teaches all ages, from kindergarten on up. He and a friend would play the music, he’d introduce the hula and we would dance. We also performed at luaus (feasts) and at Volcano National Park. He once took us to the edge of Kilauea, an active volcano, and we danced for Pele, the Goddess of lava. We walked over the restricting ropes. When Forest Service came out, they saw that it was Kumu, so didn’t do anything. He is a known and respected teacher throughout Hawai’i. The best day of the month was when we would dance hula in the ocean. It is as glorious as it sounds. In the Hawaiian culture, one often chants before entering a space so Kumu would stand at the edge of the ocean and we would line up behind him. He would then chant us in, we’d walk back and forth to loosen up and then he’d play his ukelele and we would dance in waist deep water. Photos of us have gone home in many visitors’ albums. I also volunteered at the library and created a Community Seed Library whereby we collected and dispersed vegetable, flower and herb seeds to get people growing their own food and once a month we’d bring in a speaker on some aspect of gardening. And I was on the Board of Kona Beth Shalom. And, yes, there is Chabad on the Big Island. I used to teach Sunday school and for years taught about the Law of Return. It was always in my mind to move here “one day”. Then I realized, if I’m going to do it, I need to do it while it is not physically challenging to do so. All the signs pointed me here and I’m so very glad they did.